Need to get up and running with RDF Studio fast? We show you a quick walkthrough that will get you up and running with the basics. Open a simple RDF document. Select an ontology vocabulary to see the semantics in the RDF. See the classes and properties in the Semantics panels. Draw a graph of the data. Make a few simple edits of your own and see how RDF Studio updates all its panels to show your changes. Firstly, if you are new to RDF Studio then welcome! You can ask questions or make comments on our tutorials - simply use the comment facility at the bottom of this page. 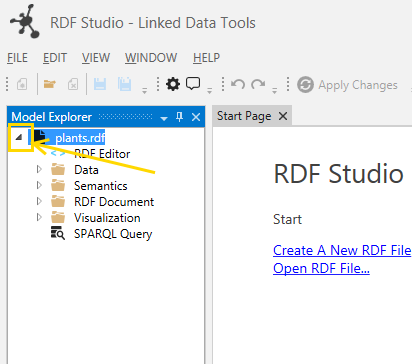 Click on "Open File..." in the FILE menu, or click "Open RDF File..." on the Start Page (the tab that is visible when you first open RDF Studio). 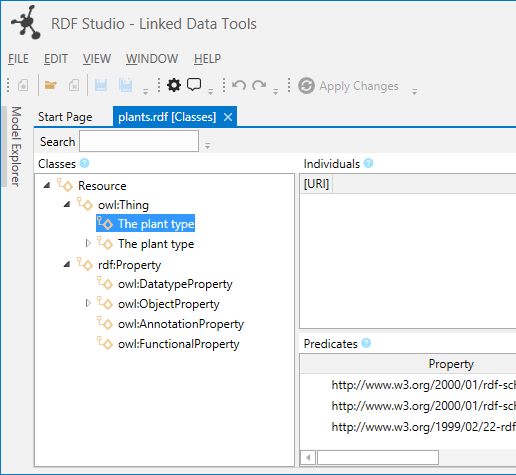 Open plants.rdf, which you can find in the installation directory of RDF Studio (for example, C:\Program Files (x86)\Linked Data Tools\RDF Studio). 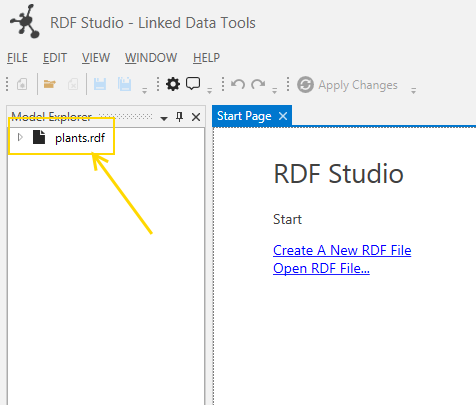 On the left hand Model Explorer pane, you should now see plants.rdf. 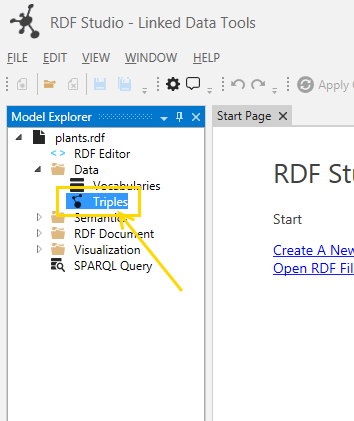 Unfamiliar with triples in RDF? We recommend you start with our Semantic Web Primer series to get you started. When you double click the Triples node, you should now see the triples panel open showing all the triples in the plants RDF model - comprising the subject, predicate and objects. On the right hand side of the RDF Studio window you should also see the Properties panel. When you click on an RDF triple, see how it shows you the subject, predicate and object. Note Keep an eye on the Properties panel - when you click on various things in RDF Studio, it will often show you greater detail or help on what you are looking at. Now we want to dig a little deeper and see the semantics our plants.rdf file contains. To start with, let's look at its classes and properties. 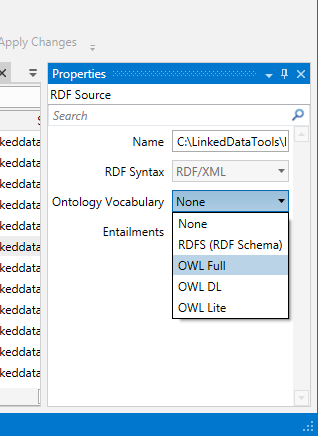 To do this, we need RDF Studio to see the data using an ontology vocabulary - such as OWL, or RDFS. 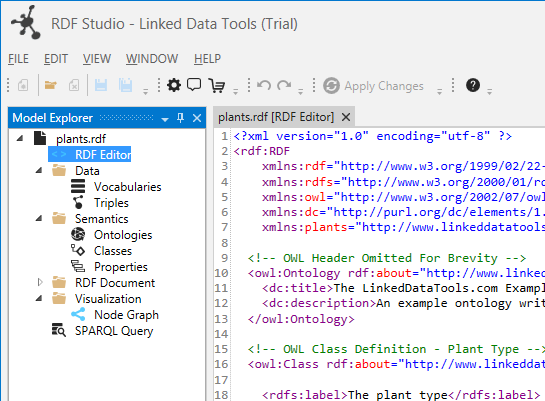 The plants.rdf file may have OWL in already, but RDF Studio won't start interpreting that OWL until we tell it to. So let's select an ontology vocabulary through which to interpret our plants RDF data. Not sure what classes are? Our classes and individuals concept tutorial will get you up to speed. 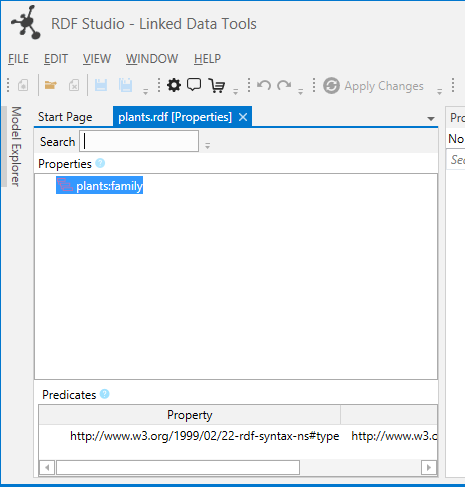 First, select the plants.rdf file again in Model Explorer. On the Properties panel, you should now see various properties of the plants.pdf model. Notice if you click on a particular class in the class hierarchy, you will again see some details of your selected class in the Properties panel. Now you have looked at the classes view, see if you can find your way around the properties & subproperties view. To open the properties view, double click on the Properties node under the Semantics folder. Not sure what properties are? Our properties concept tutorial will get you up to speed. The Properties view shows the properties, and subproperties hierarchy defined in the model. For plants.rdf, we have a single property defined: the plants:family property. If you select it, you will also see the predicates defined for this property in the predicates sub-panel - in this case showing that it is an instance of an OWL datatype property. Note If you are new to RDFS & OWL, we recommend reading our RDFS & OWL primer tutorial as a way of getting started. There may be times where visualising your RDF model as a graph gives useful insights into how the model is structured. 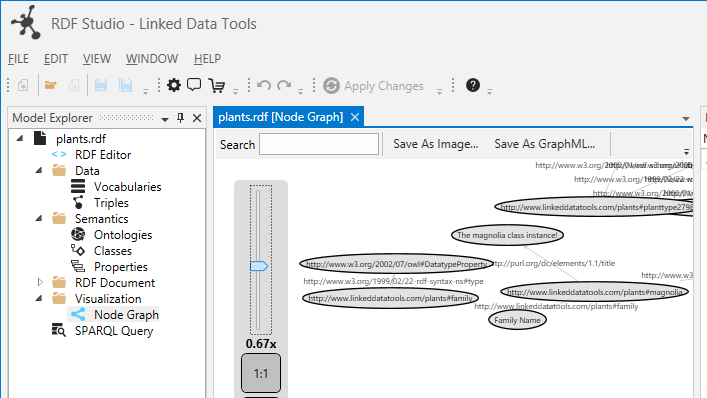 RDF Studio allows you to quickly draw a graph of the model to see the nodes, and predicates (arrows) in the model which you can then export as an image (for use in presentations) or a GraphML document (which you can load into other programs). Note Drawing graphs for RDF models with a large number of nodes is not recommended, as such graphs tend to be overly complex. You can use the mouse to drag the nodes around the graph area to finetune it before exporting it. You can also zoom in and out of the graph using the zoom control. We've seen the triples, classes and properties in the model, as well as viewed the model as a graph of nodes and predicate arrows. What we haven't seen yet is the RDF syntax itself the model is built from. If you're the sort of person who prefers to edit something by getting right down to the syntax, this will be the tool for you. 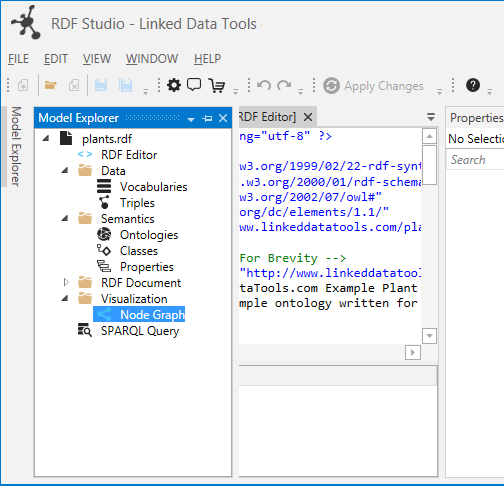 Just as an experiment, try editing some of the XML tags in the plants.rdf document, and see how RDF Studio intelligently suggests what terms you may mean or wish to add as you type. We will explore this feature further in later tutorials when we come to building our own ontology. How to view the triples in the model. How to view the classes and subclasses in the model. How to view the properties and subproperties in the model. How to draw a basic graph of the model, showing the nodes connected by predicate arrows. How to view the RDF syntax of a model in the SmartRDF editor, and make some minor changes. where can i download this Free editor ?